Crescent Towers II a wonderful oceanfront retreat that is nestled in the Crescent Beach section of North Myrtle Beach, South Carolina. This North Myrtle Beach resort is close to the popular Myrtle Beach area golf courses, the popular fishing pier, popular outlet malls and popular seafood restaurants. And the North Myrtle Beach vacation rentals are all beautifully furnished so the time you spend in the comfort of your North Myrtle Beach condo will be most enjoyed by your family. Choose one of the two-bedroom North Myrtle Beach vacation rentals at this oceanfront resort and you will have accommodations for up to six people. These spacious two-bedroom condos in North Myrtle Beach, South Carolina have two baths to better suit your family’s needs. All of the modern conveniences of home are found right here in these North Myrtle Beach rentals, including a dishwasher and a washing machine and clothes dryer. All the aspects of a beach vacation are also present at this North Myrtle Beach resort, including a sparkling blue swimming pool and oceanfront views from the balcony. 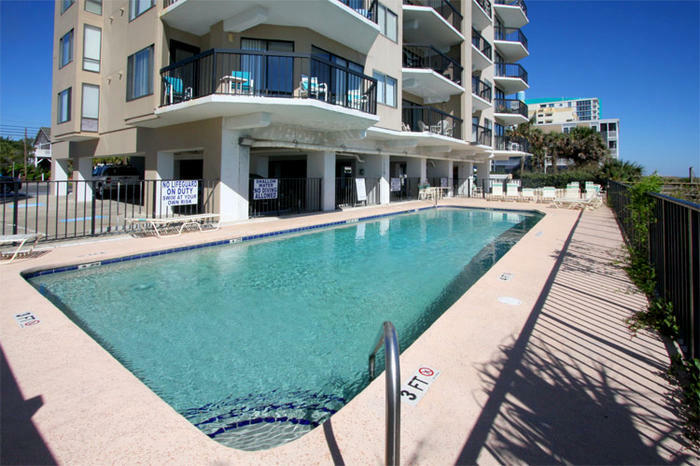 Inside these nicely furnished North Myrtle Beach condominiums you will find two private bedrooms and a great room. The great room consists of the kitchen, dining area and living room. At one end of the living room is access to the oceanfront balcony. It is through sliding glass doors that you get outside to your private balcony and it also through these sliding glass doors that the sun comes into your North Myrtle Beach condominium beautifully. While you stand in the kitchen making snacks for the kids you can see the blue Atlantic Ocean and when the doors are open you can feel the gentle sea breezes. The living room in each of these condos in North Myrtle Beach, SC is so comfortably furnished. Watching television in the evenings or seeing the news first thing in the morning during your North Myrtle Beach vacation is a pleasure when you can look right outside to the white sandy beaches below. The dining table in these North Myrtle Beach rentals is as suited for playing games with the whole family as it is for eating a home-cooked meal during your North Myrtle Beach vacation. There is a dishwasher among the full-size appliances in the kitchens of these two-bedroom North Myrtle Beach rentals. Put away your drinks in the refrigerator and keep milk on hand for bowls of cereal. It is easy to keep your regular morning routine during your North Myrtle Beach vacation when you have a refrigerator, microwave, stove and oven at your fingertips. Send emails and check your favorite blogs, or post to your own blog, during your North Myrtle Beach vacation at Crescent Towers II because the North Myrtle Beach rentals here have high-speed Internet access. While you are logged online you can check out the menus for nearby restaurants. That may help your family decide which of the more than 1,500 restaurants you will most want to try during your beach vacation. Look for coupons, tee times and store hours while perusing the Internet for all the terrific amusements and attractions located in the Myrtle Beach area. The North Myrtle Beach condo rentals at Crescent Towers II have at least one DVD player. So you might want to pack your kids’ favorite movies in case they need a little break from the sun or staying in one evening sounds like a relaxing idea. Having all of these amenities at your fingertips means you can spend more time enjoying your beach vacation. Step onto the oceanfront balcony and admire more than the blue waters of the sea. The bright blue swimming pool is also on the oceanfront and is clearly visible from your private balcony at Crescent Towers II. Slip into the pool for a refreshing swim or go out to the Atlantic for some shallow-water wading when you want to cool off. Building sand castles and taking long walks on the beach are all part of the fun of a North Myrtle Beach vacation. Just remember to take along a sand bucket every time you go out to the beachfront because the number of seashells you will undoubtedly find while enjoying the white sand is astounding. Take them home as souvenirs of your enjoyable beach vacation at Crescent Towers II. Right around the corner from this North Myrtle Beach resort you can easily find Restaurant Row, shopping and dining at Barefoot Landing, Alabama Theatre, House of Blues, parasailing, more than 100 Myrtle Beach area golf courses and deep-sea fishing charters. On land, sea and air there is much to enjoy about a North Myrtle Beach vacation at Crescent Towers II. Make reservations today for a memorable North Myrtle Beach vacation that your whole family will appreciate.